Mayotte Magnus’s Illuminating Women features stage actors, novelists, artists, editors, and publishers whose breakthroughs coincided with the Feminist movement of the 1970s. 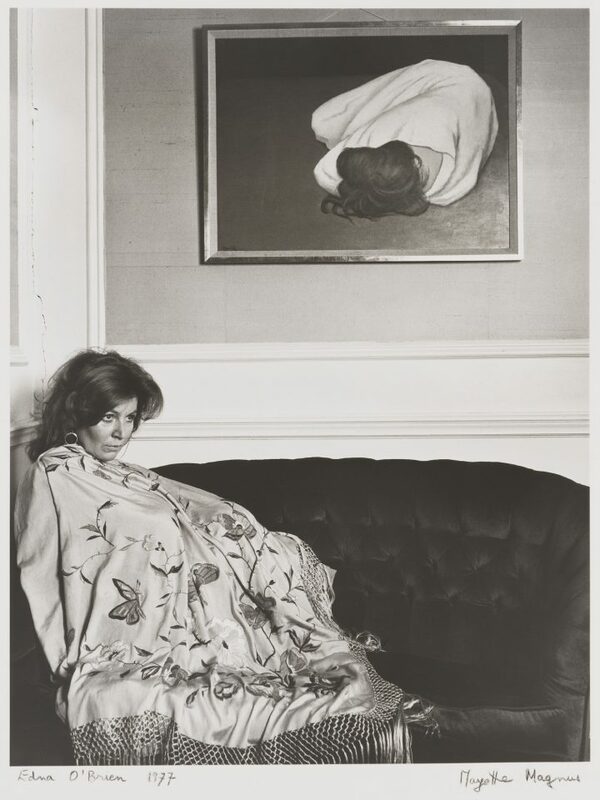 LONDON — Photographer Mayotte Magnus’s portrait of Irish novelist Edna O’Brien captures her at home in Chelsea, curled up on a sofa, blanketed by a shawl, gazing across the sitting room. Magnus’s composition takes in the surrounding space, including what looks to be a Clifford Hall painting on the wall. Hall’s painting depicts a reclining woman hidden under a white shawl, her face turned from the viewer. By contrast, O’Brien is all presence and awareness. Her colored shawl abounds with flora and fauna and its tassels overspill the sofa, as if evoking the voluptuous realism of O’Brien’s books — books that, not long before Magnus photographed her, had been banned and burned in Ireland, mainly due to their frank depiction of women and sexuality. Such storytelling about women in the arts animates each of the 15 portraits in Magnus’s Illuminating Women here at The National Portrait Gallery. 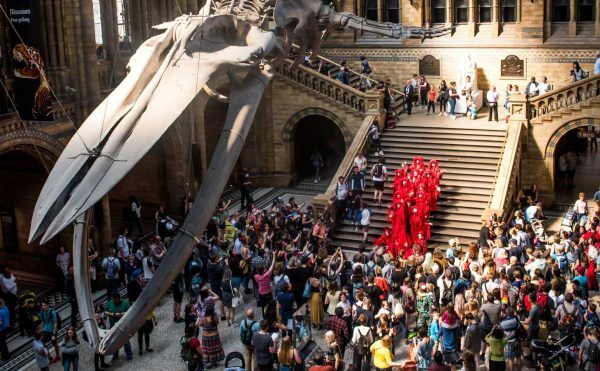 The exhibition features stage actors, novelists, artists, editors and publishers whose breakthroughs coincided with the political and social changes ushered in by the Feminist movement of the 1970s. In its original 1978 incarnation at this same museum, from which the images in Illuminating Women were drawn, Magnus’s series portrayed nearly 100 British women. Decades later, most of the 15 figures in this current exhibition are still producing culture-defining work. 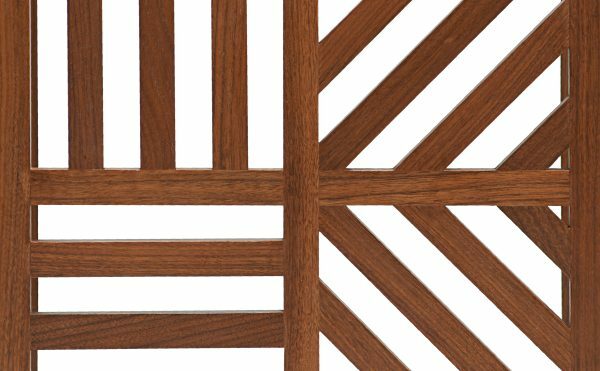 Mayotte Magnus brings an insider’s outsider view of British culture. Born in Algiers and raised in France, she moved to England in the late 1950s. By the early 1970s, having given up careers in ballet and painting, she began taking photographic portraits of British artists, including the likes of Francis Bacon and Elisabeth Frink, which led to the commission from The National Portrait Gallery to create the cultural series honored by Illuminating Women on its 40th anniversary. Intentionally or not, by framing artists inside their studios and homes, Magnus ensures that the presiding spirit of Illuminating Women is Virginia Woolf, whose famous avowal A Room of One’s Own (1928) confronts how centuries of sexism have silenced talented women while arguing that a woman’s genius requires untrammeled privacy in order to realize itself. It is fitting, then, that UK-based writers who followed in Woolf’s footsteps figure so prominently in Illuminating Women. Like O’Brien, Nobel laureate Nadine Gordimer’s fiction outraged repressive forces in her native country – namely the racist government of South Africa. Magnus depicts Gordimer in a probing close-up, her arms raised in openness, not defensiveness. Novelist (Dame) Margaret Drabble’s best known book might be The Millstone (1965), the story of a freewheeling academic who achieves independence and motherhood in modern London. But in a portrait that casts doubt on the writer’s personal freedom, Magnus depicts Drabble in her backyard staring through a door window that is itself framed by kitchen implements. 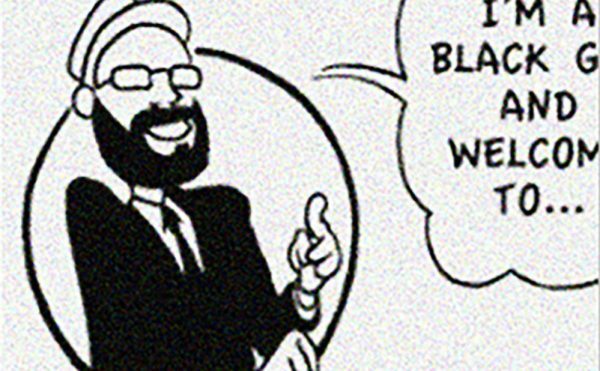 The toll of artistic work is often present. A remarkably candid portrait of the prolific British writer Beryl Bainbridge shows her on a break from writing, lost in thought, awkwardly lounging on a sofa. There is a sun-drenched portrait of Margaret Busby, whose publishing house brought numerous black writers into the UK’s literary mainstream. 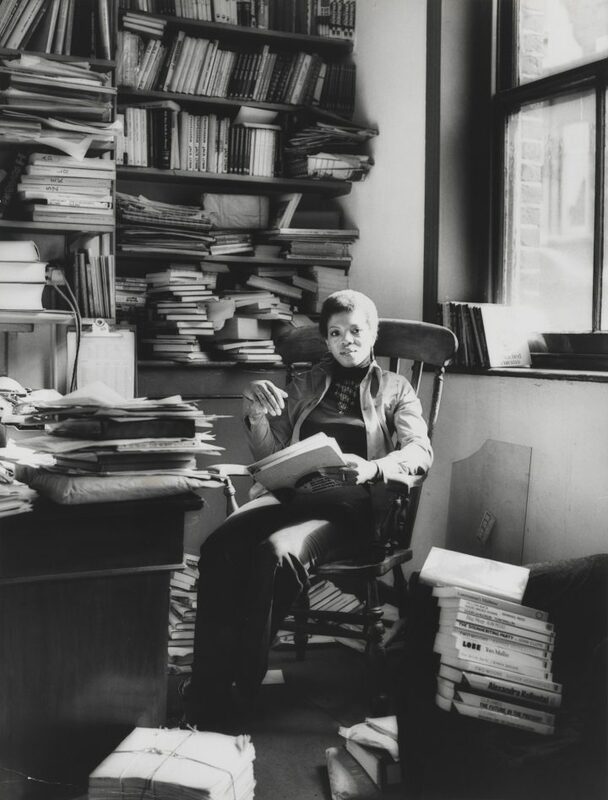 Busby sits surrounded by manuscripts and books piled so high on a desk, chair, and overhead shelves that they loom like precariously teetering towers. By contrast, she holds the center of the composition as a figure of serene poise, drenched in the sunlight ricocheting around her office. Industriousness, solitude, and playfulness – those sequestered byproducts of creative vocations — serve as the exhibition’s unifying themes. A young Tina Brown, then the editor of Tatler, seems to be intuiting her future as a transformative force in magazine publishing as she reclines on her bed posed in her disco-era gown’s décolletage, her room furnished with exotic prints, a state-of-the art stereo system, and paneled wall mirrors. Alongside Brown’s youthful cameo, the photos of British stage legends (Dame) Glenda Jackson and (Dame) Judi Dench present probably the two most well-known faces in Illuminating Women. Although both are pictured offstage, there’s an effortless theatricality infused into Magnus’ portraits of them. Beaming and smiling as she leans over a wall in the churchyard of Saint John-at-Hampstead (1977), Dench’s intensity animates that stony, funereal setting. Her vibrancy in such a lifeless location subtly references her dawning status as the preeminent Shakespearean actor of her generation. Here she is metaphorically straddling comedy and tragedy, having just grabbed the baton from what had been — from the days of Edmund Kean to the era of Laurence Olivier — an exclusively male line of succession. 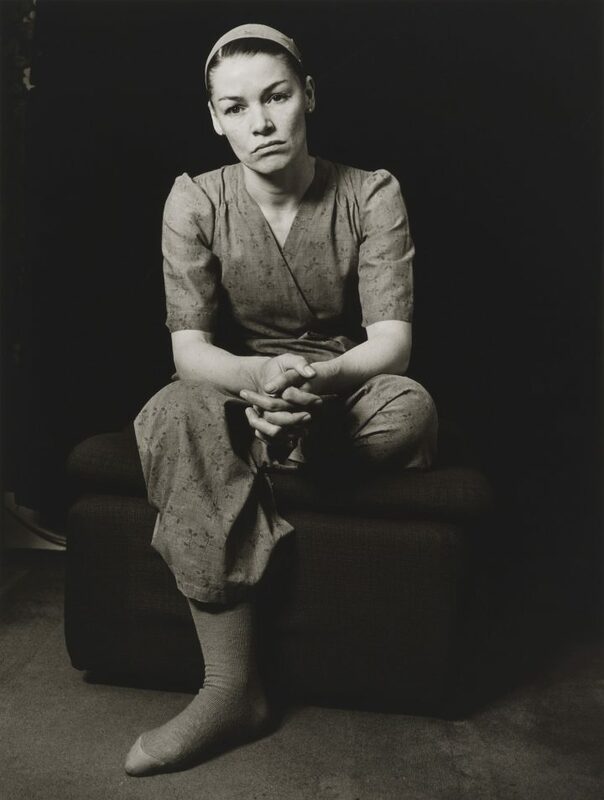 Dressed in overalls and a headscarf, Glenda Jackson, having come to recent fame in critically acclaimed, subversive dramas like Marat/Sade (1968) and Sunday Bloody Sunday (1971), is pictured in costume before her West End run in the play Stevie (1977) in which she took up the role of British poet Stevie Smith. As is the case with most of Magnus’s portraits, Jackson is represented as a doubled identity – she embodies the death-haunted poet Smith while her piercing gaze and demonstrative physicality speak to the actor’s blend of charisma and resistance. This doubling, or mirroring technique, is detectable even in the more straightforward portraits. We find the British composer (Dame) Elisabeth Lutyens, pictured a short time before her death at the age of 76, in a bare dining room under bay windows. But Magnus instills this bland domestic setting with multiple allusions to the composer’s avant-garde serial technique. Dressed in a checkered blouse and a striped sweater, she sits at a round table carved with radiating lines anchored to the table’s disc-shaped center, while the unfurnished bench couches the composer in a sequence of vertical slats. This intertwining between the artist and her art most interestingly plays out in two portraits of visual artists. One is sculptor Glenys Barton, known for classically inflected figurations that complicate the individualizing aims of monumental portraiture. 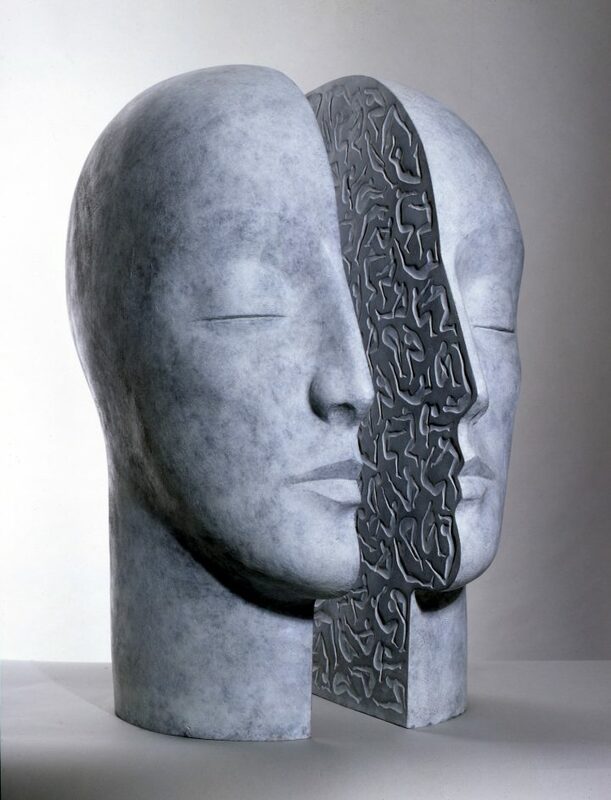 Often, Bartons’ semi-abstract work features heads emerging from a common figure and flowering into competing profiles; others contain multiple figures brought into such close contact that the individual forms integrate themselves into a larger wholeness; her bisected busts often make visible their equally artful underlying layers, as if they’re ancient sculptures exposed like mannequins in a biology lab. In corresponding fashion, Magnus’ portrait of Barton generates a dramatic interplay between the real and the abstract, and between surface and depth. With the sculptor’s hands pressed to the sides of her face, she looks both sanguine and drained, yet her fixed gaze suggests that her mind is focused on the future. 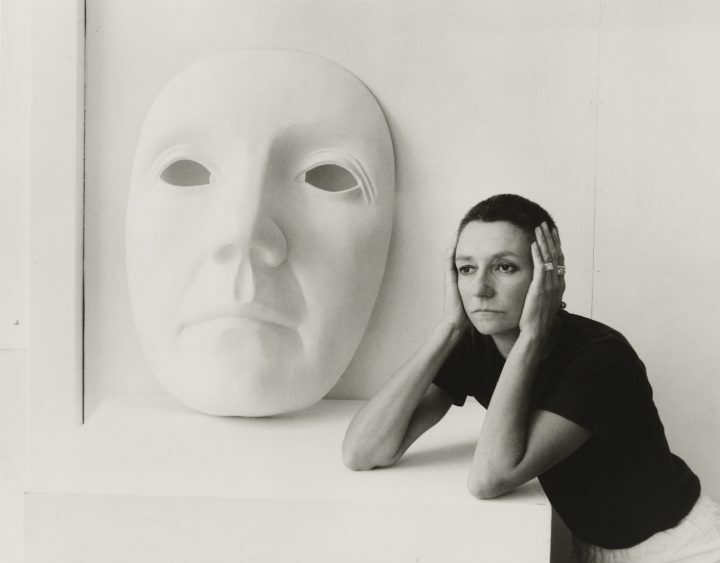 Deepening this psychological atmosphere, Barton’s face is dwarfed by her semiabstract, sculpted self-portrait – a hieratic white mask propped up against her studio wall. 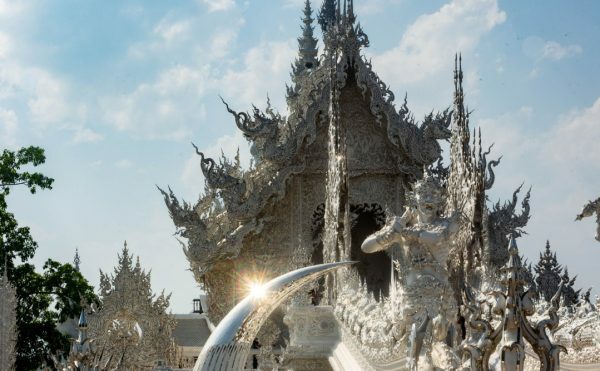 This blindly bright white “room of one’s own” is not only a site for sculptural labor but also a temple for complicated self-reinvention. 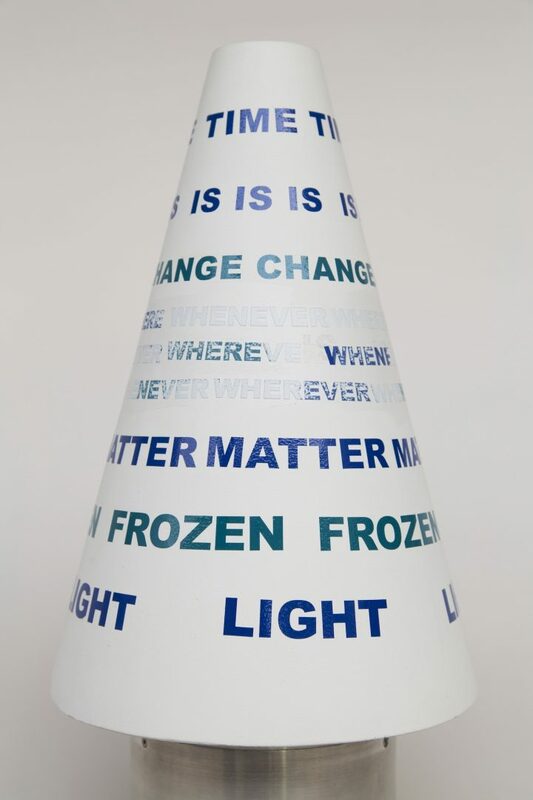 Similarly, Magnus photographs the American-born, British-based kinetic sculptor Liliane Lijn in her studio, also in an autobiographical dialogue with her work. 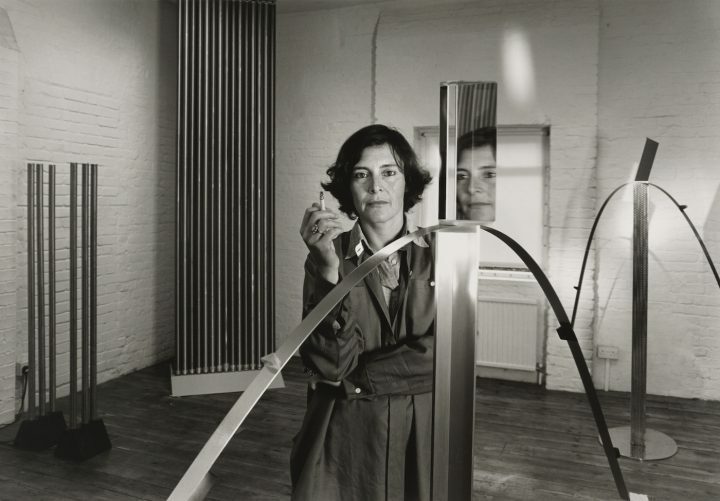 Holding a cigarette, the artist stares squarely into the camera, standing surrounded by her metalwork installation made up of interconnected metal arcs transected here and there with mirrors, one of which reflects her in profile, creating a double portrait of the artist. She is both the living molder of her medium and an alternative self that lives inside the sculptures she makes. Of course, Lijn’s question has direct relevance in thinking through Magnus’s chosen medium, photography itself, which seeks to immortalize human beings through the mechanized manipulation of light. Magnus’s portraits take this technology one step further. By training her lens on artists and writers in Britain who broke through a male-dominated culture that consigns women to the shadows, Magnus translates a well-documented, ongoing social struggle into the light-filled, solitary spaces of its extremely individualized, self-creating luminaries. Illuminating Women: Photographs by Mayotte Magnus continues at The National Portrait Gallery (St Martin’s Place, London, England) through March 24.